Although some fractals today can look extremely realistic, rendered in three dimensions and having an appearance as photo-realistic as any photograph, I find they don’t usually mix well with photographic elements used as backgrounds or when embedded as repeating pictures in formulas. There’s no technical reason for this, computer-made imagery like fractals just seems to clash aesthetically with imagery from the real world. But just recently I discovered a few examples of just the opposite; harmony and synergy in a image mixing fractal and non-fractal imagery. Up until now most attempts to combine the two haven’t looked so great and even now these images shown here are still quite unique in that they combine two different kinds of imagery with successful results. This is by far the most effective use I’ve ever seen of blending photographic imagery with fractals. I think this is exactly the kind of sinister, predatory plant that John Wyndham imagined in his classic science fiction novel, The Day of the Triffids. 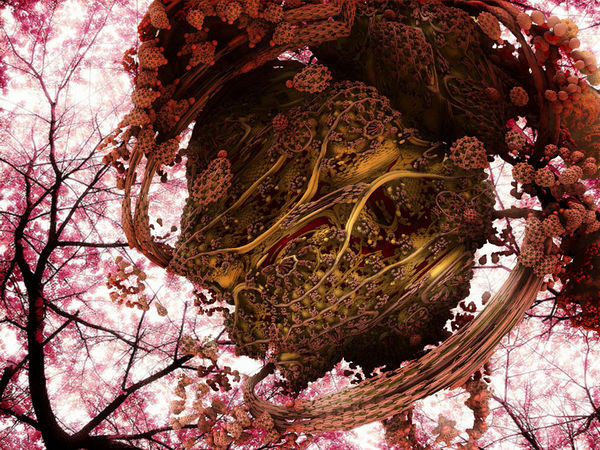 Note the subdued and sweet “cherry” flavored color in the blossoms on the trees in the background and also carefully mixed into the fractal “blossom”. I’m assuming that was intended, but even if not it’s a very nice touch, a sort of wolf in sheep’s clothing theme; camouflaged fractal predator. The mandelbulb object seems to almost have a grimacing mouth and squinted eyes. The low, worms-eye-view perspective (looking up) suggests a large, looming creature. 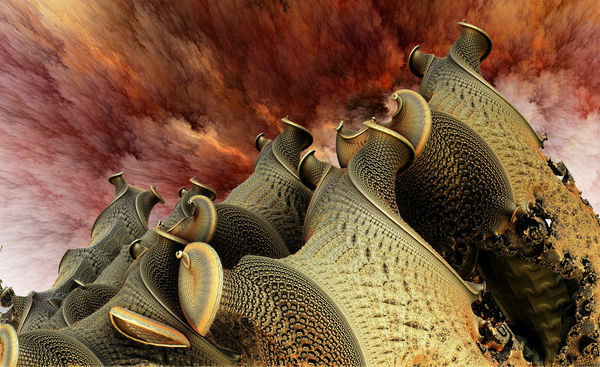 I don’t think a professional artist could have done any better with this mandelbulb image than Mr. BrutalToad has. It ought to look out of place with the photographic background but instead it merges into it naturally and the two complement each other perfectly. Another superb combination, this time of a mandelbox fractal with an image of at least differing origins if not entirely photographic and real. I’m not absolutely sure if the image of the sky which forms the background is a photo or not but it’s clearly not part of the mandelbox. On her Deviant Art page Fiery-Fire refers to it as a “beautiful nebula by Ali =casperium“. The two go together so well I’m sure Fiery-Fire took a great deal of care in selecting and positioning the background to get the great effect it has. Perhaps that’s what makes mixed media fractals so hard to make: you need multiple skills and multiple programs. But when it’s done this well it looks easy. The exploding nebula dust-sky is of course an overcast one and this matches the diffuse light in the fractal image. 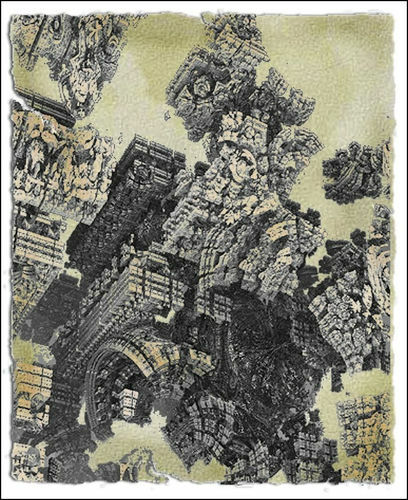 Furthermore, the “camera” position in the fractal image is looking up at this towering clump of fractal shapes whose composition leads our eye right up the clump to the one at the top and into the strange, alien clouds. It’s not a fluke; Fiery very carefully crafted this image. Many great fractal images are simply found while exploring a vast fractal generated panorama, but if you want to incorporate other kinds of imagery, particularly photographs, into a fractal image then you’re going to have to work a little more and you’re going to have to juggle two often opposing mediums. Brutaltoad and Fiery-Fire have achieved some really great results in the two images shown here but I think their success is rare and not as easy as it may look. Guido Cavalcante has pursued a mixed media style of fractal art for some time now. I have not one, but four of his images here. Three of them are 3D fractals like Fiery-Fire’s and BrutalToads. All of them were made in Ultra Fractal, sometimes with a little help from Photoshop and sometimes just UF and its versatile image importing features alone. Guido’s style is different but his methods and tools are the same as any fractal artist who pursues mixed media. Wouldn’t you rather live in a computer than the real world? Of course there’s more than one real world to chose from. Here’s a golden mandelbox with a third world slum in the background. 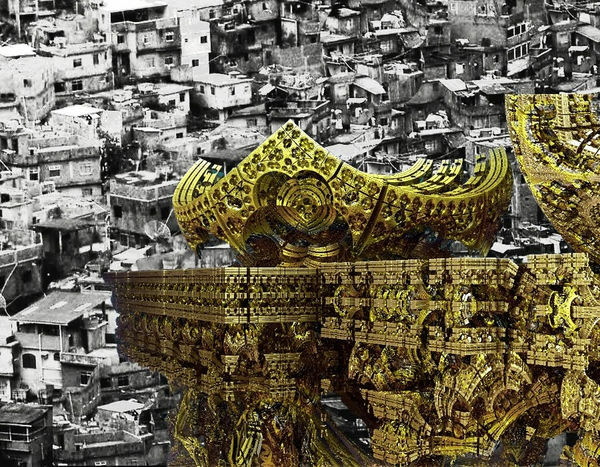 It’s not an image that requires a lot of explanation; the golden computer temple is contrasted with the bleak, B&W misery of the slum world. There’s more: each is a highly detail edifice; the individual slum houses merge into a single, organic-looking multi-celled organism. The mandelbox is equally detailed and yet the expression of just one formula with three dimensions: length-width-depth; food-clothing-shelter. It’s a very clever contrast and done so simply. Golden fantasy vs. concrete reality (no pun intended). It’s the cow that “makes” this one for me. But perhaps the movement of the tangoing couple accentuates the simple pastoral calmness of the grazing cow. 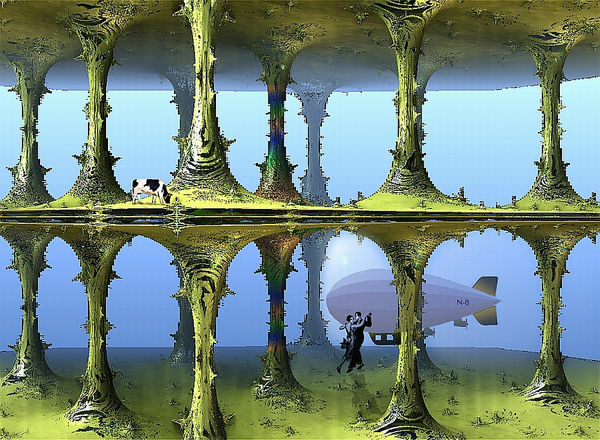 I don’t know about the airship, but it does give some depth and perspective to the great, mossy mandel-palace. Old dance halls used to be distinguished by their many pillared rooms. They were built at a time when the strength of structural materials was not as great as it is today and therefore had many more vertical supports. One can make up a million stories for images like this but to me it’s instantly a palatial dance hall in decay like a wonder from the ancient world. Alright. Where’s the mixed media? All I see is a mandelbox overlayed with a texture and given a torn paper drop shadow border. But together, mixed together, they create a papyrus fragment depicting the fall of Syracuse, an ancient city thought to be impregnable (secure) but conquered by some sly ancient Greek (better check that). I like the coloring too. Looks like a hand-tinted engraving out of a Victorian book (ripped out of a Victorian book). Fractal? Where’s the fractal art? I know what you’re thinking: it’s all made with Photoshop. And the space station, grey cylindrical thing? A quaternion? The planet in the center looks like a fractal image mapped to a sphere. UF is the photoshop of fractal art and Guido’s image here is a great example of those features. I like the space theme; fractals often lend themselves to fantastic, extraterrestrial contexts. 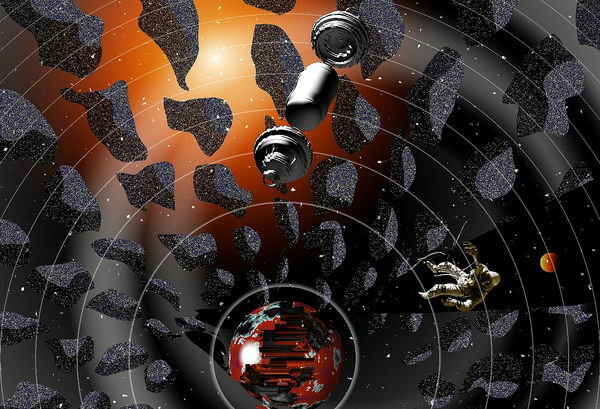 It’s like a graphical voyage or graphical exploration of space: not a real, but a mythical space. You can see more of Guido’s work on his blog, Fractalmix. Mixed media fractal imagery can be very expressive when done well like it has been in these six images. It’s a graphical twilight zone where the virtual meets the real. But some just call it digital art. ← Why Image files are very different than Parameter files: Derivative Works! I am grateful for your interest and at the same time pleased that you have found some elements in my images to substantiate your ideas about the relationship between various media and content that we can achieve through the combination of them. I can not conceive images that mean nothing. When an image is purely ravishing, when it denotes a visual artifice without any significance, I believe the interest in it will be quickly exhausted. Instead, images are living from a sense of thought, rather from an elusive and fortuitous relationship with the composition itself. So I always work from an idea, often only a rough guess, that little by little is constructed to form an expansive meaning of the medium I’m working. In this sense, besides the intrinsic beauty of the fractal, despite its random and “wild” nature, I try to reach some sort of conclusion about the means at my disposal, to formalize an understandable visual concept. Therefore I believe that the invention is a dominant factor in producing an image, much more than its perfect result at the end. I always think that if we can observe how things were done, even when the image is not fully implemented it becomes much more interesting, more full of life than the consummation of a formula. I always try to emphasize an element of doubt, uncertainty, something incomplete, that are significant to me the limits of the images, what they can not overcome. Then I’m interested in representation that failed, ie, representations that are presented as a ruin, as a frustration. Then, as in life, which is also incomplete, images can become a bit more interesting than pictures that we would consider like to be perfect or well done. BrutalToad’s “Cherry Blossoms” and Guido Cavalcante’s “The Hanging Garden” are very fine examples of mixed media, and well chosen for inclusion into this particular discussion. The latter is also quite nice as “super-realism” that even the best surrealists would have to acknowledge.